Sao Tome and Principe is set for a run-off presidential election after former dictator Manuel Pinto da Costa failed to win an overall majority in the weekend's first round, state radio reported Monday. "Taking into account the data that we have, the second round is now a certainty," the radio said as its correspondents gave bureau by bureau results after Sunday's vote, with counting of the first round ballots continuing. It said former strongman Pinto da Costa led the 120 candidates, but did not have an absolute majority. The radio said one of three candidates was most likely to challenge Pinto da Costa in the second round to be held next Sunday: former prime ministers Maria das Neves and Evaristo de Carvalho, and Delfim Neves. There were delays in counting and collating the votes, and the first results would not be announced until later Monday, a member of the electoral commission told AFP at about 2:00 am (0200 GMT). Pinto da Costa, who was favourite in the vote, played a crucial role in the quest for the tiny, impoverished west African archipelago's independence from Portugal. After independence was achieved in 1975, Pinto da Costa led the country until 1990, ruling it as a communist one-party state. Since stepping down in 1990, Pinto da Costa has twice failed to get elected. The island's residents are anxious for stability in a country that has seen 18 different prime ministers since the end of the one-party political system in 1990. The UN Development Programme (UNDP) describes 54 percent of the country's 200,000 people as poor. Many are impatient for the country to start exploiting its oil resources, although diplomatic sources have said commercial production could begin in 2014. 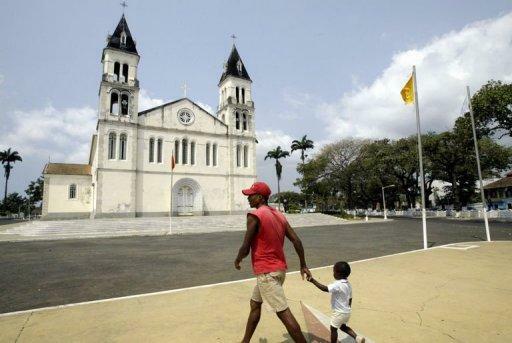 Located near the Equator northwest of Gabon, Sao Tome and Principe is one of the world's poorest countries: foreign aid makes up about 80 percent of its budget. Observers said there was a high turnout among the 92,000 voters registered to decide who replaces outgoing president Fradique de Menezes, who is not eligible to run again after having completed his second five-year term.